Three people were injured in several explosions on two fuel barges in Mobile, Alabama, officials say. The first explosions occurred around 8:30 p.m. 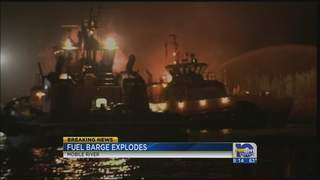 The barges, which reportedly contained natural gas, caught fire after the initial blasts, resulting in several more explosions over the next hour. The Mobile Fire and Rescue department plan to let the fire burn out to avoid further injuries. It is currently not clear what caused the explosions. This entry was posted on April 25th 2013 at 11:39am/11:39 and is filed under Live News Column 1. You can follow any responses to this entry through the RSS 2.0 feed.